The Cloud is the main focus area for business and technology activities today. And Cloud-centric companies−such as Amazon, Google, or Microsoft−are doing very well. And most of us think it is safe to assume that the future of IoT (Internet of Things), and even Big Data Analytics, is in the Cloud. However, there are some people and companies who think that a lot of IoT Analytics will be done locally, closer to where the action is, at the very edge of corporate and public networks, and sending data to the Cloud for processing will not be too frequent. And that is what Edge Analytics/Edge Computing/Fog Computing is supposed to do to support the Edge IoT. While the data is moving from the device to the Cloud, Edge computing moves analytics/computing/decision-making from the Cloud towards the device and closer to sensor data. In fact, this seems to me like an extension of the “data gravity” concept, which refers to the ability of large amounts of data to attract additional applications and services. Applications and services then move towards the data, not the other way around, especially if we are dealing with a lot of data. Notice that the last Stage on the right ( “deep analysis and compute”) is the “Cloud” and the data (gray bi-directional arrows) are connecting Stage 4 with Stage 3, which is the “Edge.” You can read more about it here: link. It looks like no one is really questioning the fact that Cloud-based analytics will remain the best choice for the most demanding computing efforts that require elasticity of storage and compute. 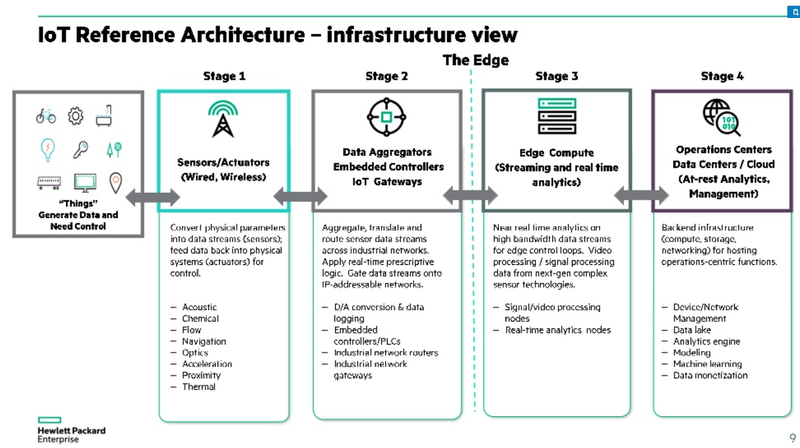 To better understand the main advantages of the Edge Computing, imagine a device generating sensor data that needs to be sampled 60 times per second and this data needs to be processed in real time. Now, imagine that such a device has hundreds of sensors and there are thousands of such devices on-site. If you need to do a continuous, compute-intensive analysis on this data, it is much cheaper and much more reliable to do this right next to those devices rather than stream the data to a location hundreds of miles away, and then stream the outcome of the computation/decisions back to the device. This is what Edge Analytics will do − collect the data and process it locally and in real time and synchronize it with the Cloud periodically for information-sharing purposes, to get the latest updates, etc. Companies such as HPE, Amazon, and Microsoft are already investing heavily into Edge Computing and Edge IoT. HPE, for example, sells their EdgeLine servers for this very purpose, while AWS offers its own solution called Snowball Edge, which is good for storage and data transport as well as for running some event-driven analytics in the environment that is less dependent on the Cloud and on data communication with AWS. Finally, Microsoft Azure has released an SDK to make some of their IoT analytics local: link. Some estimates suggest that 30% or more of the future IoT market growth will be associated with the Edge. One way or another, this is an important field to pay attention to in the near future.